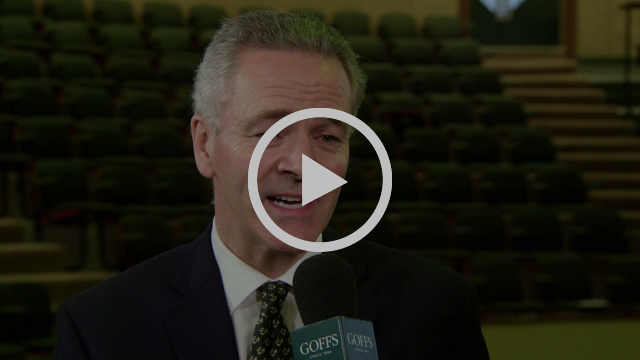 A record price of €3.2 million for the Galileo own-sister to Oaks winner Forever Together crowned an incredible renewal of the Goffs Orby Sale, with trade across the two days posting considerable increases in turnover, average and median over last year and a total clearance rate of 89%. The show stopping top lot, Lot 318, consigned by Ballylinch Stud on behalf of breeders Vimal and Gillian Khosla, made history becoming the highest priced filly ever sold at Goffs, and the highest priced yearling anywhere this year, when selling for a staggering €3.2 million to Phoenix Thoroughbreds, just 24 hours after they purchased the Galileo sister to Alice Springs (Lot 165) for €2 million. David Redvers secured the next highest priced lot on the final day when going to €525,000 for another outstanding Galileo filly, this time from the Baroda & Colbinstown Studs draft, out of the dual Group winner Maureen (Lot 397). A pair of Camelot fillies provided two further highlights on Day 2, with Glenvale Stud’s Lot 295 selling to Godolphin for €500,000 while Camas Park Stud’s filly out of a sister to Group 1 Dewhurst winner Distant Music (Lot 277) sold for €480,000 to BBA Ireland. The top priced colt today was a son of Exceed And Excel from Croom House Stud (Lot 352). Out of a half-sister to Order Of St George, he sold to the Hong Kong Jockey Club for €360,000. “Wow! What an amazing couple of days we have enjoyed at Goffs as the Orby Sale reached unprecedented heights with a trade that was simply extraordinary. 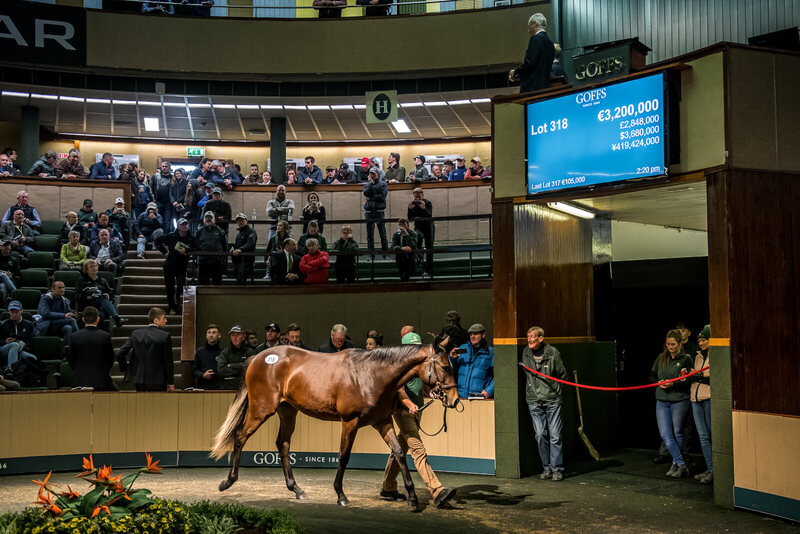 To set a new record for a yearling filly at an Irish sale at €3.2 million was the highlight amongst a sale of tremendous highs that saw all the average and median make double digit gains to buck the trend of the European sales season so far, and all from a stunning clearance rate of 89%. 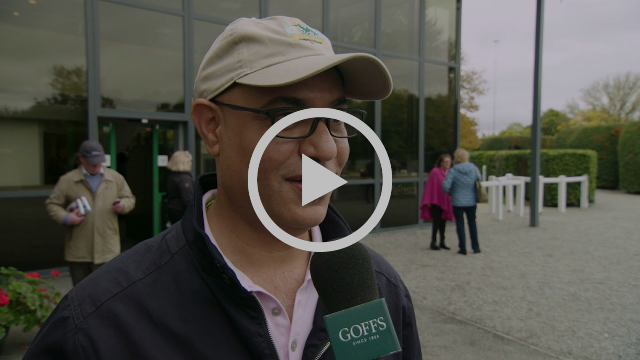 We are indebted to our vendors without whom we are nothing and I would especially single out Vimal and Gillian Khosla, the breeders of the top lot, who placed their faith in the Goffs service and were rewarded with the highest yearling price in the world so far this year for their gorgeous filly who was so well presented by Ballylinch Stud. In addition we would like to extend our thanks to Ciaran Conroy’s Glenvale Stud and the vendors of the “other” Galileo filly whose price of €2 million was also something quite special. We took the conscious decision to tighten the catalogue numbers to really focus on quality this year and it is clear that our huge array of buyers from home and abroad agreed with that move. Our vendors sent us a stellar selection and we were delighted to welcome so many major buyers to Kildare Paddocks over the last few days. That HH Sheikh Mohammed made his first visit to Goffs for 13 years was a huge vote of confidence in Irish bloodstock and he joined his brother HH Sheikh Hamdan who has been such a great supporter for so many years. Our leading buyers Phoenix Thoroughbreds were a revelation in the sales ring and we hope their bold bidding is rewarded with top level success on the racecourse in future years. They have been a pleasure to do business with and their enthusiasm is infectious. It would also be remiss of me not to record our ongoing appreciation of MV Magnier and the Coolmore team who remain stalwart supporters of Goffs year in, year out. The aforementioned are, of course, the big names and we need every buyer at all levels so, on behalf of all the team at Goffs, I extend our appreciation to each vendor of every lot for giving us the opportunity to promote their world class yearlings to our wonderful buyers from all over the world who were attracted to this sale by the persuasive efforts of my excellent Goffs colleagues and our international agents, backed up by the team at Irish Thoroughbred Marketing”. We have received your catalogue order and will process it as quickly as possible.